Key stat: Ferrell became Clemson's first two-time, first-team All-America pick since Terry Kinnard in 1981 and 1982. The skinny: Ferrell was a standout prep player at an all-male military school, Benedictine College Prep in Virginia, where he suffered a torn ACL as a senior. But as a reflection of how highly rated Ferrell was as a recruit, he was still invited to the prestigious Under Armour All-American game, even though he was unable to play in the game. Clemson landed the star pass rusher and had big plans for him before a hand injury forced him to redshirt as a freshman in 2015 after playing only one game. 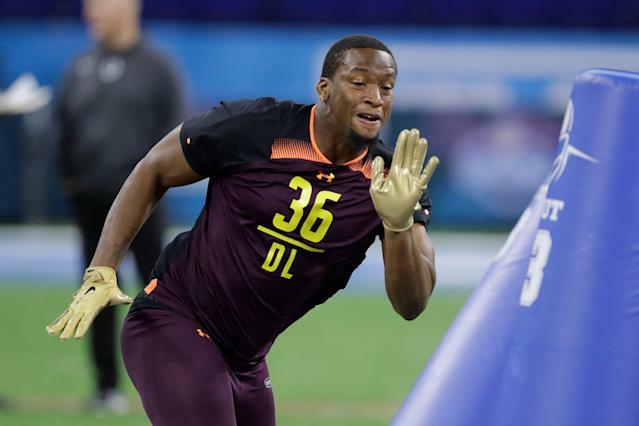 The following season in 2016, he was named co-Defensive Rookie of the Year along with fellow 2019 draft prospect Dexter Lawrence in a standout freshman season with 50 tackles (12.5 for loss) and six sacks in 15 starts. The Tigers won a national title, and Ferrell was a big part of that championship run with a combined 11 tackles, six tackles for loss and two sacks in the ACC title game and the two playoff contests (including being named Fiesta Bowl Defensive MVP in the semifinals against Ohio State). In 2017, Ferrell was named first-team AP All-American and first-team All-ACC with 63 tackles (18 for loss), 9.5 sacks and two forced fumbles in 14 starts. After losing the national title game to Alabama, he surprised many by returning to school for his junior season. It looks like a wise choice now as Ferrell helped lead the Tigers to another national title in 2018, as he was named ACC Defensive Player of the Year and winner of the Ted Hendricks Award (the nation's top defensive end) with 53 stops (19.5 for loss), 11.5 sacks and three forced fumbles in 15 starts. Ferrell, who turns 22 years old in May, opted not to run a 40-yard dash or take part in the broad or vertical jumps at the NFL combine. He also chose to skip workouts at Clemson’s pro day because of turf toe in his right foot. Upside: Strapping, broad-shouldered, powerful end with great strength and length. Can’t draw them up too much better than Ferrell at this position. Very long arms and huge hands, which he engages well both rushing the passer and setting the edge against the run. Generates serious pop with his hands and drives blockers into the backfield. Can stack and shed and force runners to go places they don’t want to. Lower-body strength is excellent. Has tree trunks for legs. Usually plays with a good pass-rush plan and can alter his game on the fly. Converts power to speed well and isn’t just a bench presser out there. Go-to pass-rush move might be his excellent dip-and-rip, but his bull rush is stout, too. Has shown better ball awareness the past two seasons, stripping five fumbles (after zero his first season) and getting his hands up better to close down passing lanes. Strong run defender who can not only shed blocks and contain but also knife in for backside tackles. Plays with balance and rarely is knocked to the ground. Attacks half a man and works through blocker to get to where he needs to go. Excellent combination of power and coordination shows up regularly. Doesn’t play out of control and isn’t fooled by draws, screens and shovel passes. Has rushed from two- and three-point stances, lined up on both sides of the line and could be tried as a 3-4 outside rusher. Possesses enough explosiveness and enough agility and flexibility to play on his feet a lot of the time. Production is unquestioned – improved his numbers each season and racked up 23 sacks and 42.5 tackles for loss in his final 32 college games. Doesn’t miss out on too many finishing opportunities. Production came in big games, too – rises to the occasion. Had great reps against Alabama’s Jonah Williams. Tremendous effort – motor runs hot. Self-made player with burning motivation. Added 30-plus pounds from his redshirt season until now. Strong personal and football character. Is not afraid of the blue-collar work that’s needed to be great. Downside: Not an elite athletic tester. Shuttle drills and 3-cone drill times were ordinary. Effort player but can’t always make plays and take down ballcarriers in space. Lacks the bend and athleticism to be a true off-the-ball defender 60 snaps a game. Shows good burst off the snap but doesn’t always channel it through on every rush attempt. Could stand to show a little more pursuit downfield. Can be a bit stiff on the top of his rush and can’t win consistently with speed. Not an edge bender. Leggy rusher whose NFL production might not be as consistent against elite athletes in the pros. Quick-twitch burst is lacking. Gives up too much of his body as a target – gets high in his stance and lets blockers get their hands inside of him when he tries to rush the perimeter. Doesn’t disengage as well as you’d like to see once offensive linemen get their big paws on him. Played on one of college football’s most talented defensive lines that went five deep with blue-chip talent. Often faced single blocking and had some free lanes to quarterbacks. Pre-draft toe injury must be vetted, and not testing fully at the combine or the pro day could cost him in a very deep DL draft class. Best-suited destination: With just a bit more seasoning, Ferrell could be an excellent power rusher in the NFL. He’s still learning to harness his physical gifts fully and he could be a Pro Bowl-level edge player in time. Some teams might wonder if he’s a perfect fit for the system they run, but there’s mass appeal for what Ferrell provides vs. the pass and run in this league. Among the teams that could be most interested in Ferrell’s services include the Baltimore Ravens, Seattle Seahawks, Miami Dolphins, Pittsburgh Steelers, Indianapolis Colts, New England Patriots, Oakland Raiders, Atlanta Falcons, Cincinnati Bengals, Los Angeles Rams, Minnesota Vikings, Tennessee Titans and New York Giants. Fact: Ferrell’s mettle was tested significantly with the death of his father, Cleavester, during his freshman year of high school. Both of Ferrell’s parents came from a military background, and they raised their eight children with a sense of discipline and self-sacrifice. Clelin considered giving up football at the time of his father’s death and his grades suffered, as he considered giving up the sport and changing schools. But his mother, Faye, encouraged him to stick with it and use his talents to help honor his father, who was a Vietnam vet, an airplane mechanic and a government worker who earned his degree after serving his country. Ferrell did just that and has carried on his father’s name with honor and pride.